So every now and then we find ourselves taking a break off the rock of Eleuthera to visit Florida – Fort Lauderdale and Miami. This year we are not taking a vacation to Europe as we have done over the last few years – family are visiting us from London instead, so we just took a short 5 day break to catch up on a few things. Here is an abbreviated version of that trip ! That evening we ate at a great Thai restaurant we have eaten at before – Asia Bay on Las Olas Blvd – lovely food and welcoming staff who always win points when they remember you ! Bob posing like Dean Colman at Seasons 52 with greek salad and mushroom flatbread …. Friday was spent doing all sorts of body maintenance for both of us – dentist, podiatrist, facial plus more that I won’t go into detail about – pretty boring but necessary ! Bob has a fantastic podiatrist called Dr Barney Greenberg in Hollywood. He has been going to him a couple of times a year for a few years now and swears that when Barney retires we will house him over here in Eleuthera so that he is always there for immediate appointments. Anyway – Bob has had some problems with ingrowing toenails – too much information ??? – and I decided it would make a nice little feature on the blog – sorry – not much is private these days ! So first of all the lovely Nurse Joanie prepared him – what a fabulous character – then Dr Barney came in to do his work. Fast or what ! – Joanie was encouraging me to take pictures of what the good Doctor was doing – which I did until it came to the gory part – yes I did have to turn away I’m afraid – which of course caused lots of amusement….. Anyway it was swift and very effective. Dr Barney doing his thing ! This was before I got squeamish and had to turn away ! 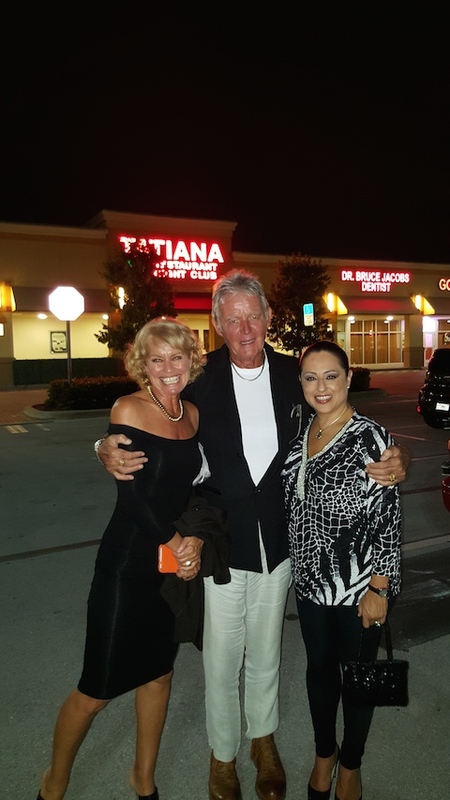 After that Friday evening was something completely new – a visit with good friends Luz and Louis Pelligrino to a Russian restaurant and nightclub in Hallandale called Tatiana’s.…… What an experience. First of all it is in a normal shopping mall on Hallandale Beach Blvd – somehow not the setting I was expecting it to be in. Inside it was very Russian – thrones, Faberge eggs and an electric green tree – very opulent ! After the lobby is a large and spacious main area – there is a cabaret show going on with singers and musicians. Of course our bedtime is usually at 9pm – that was when our table was booked for !! We ate salad and appetizers before the big show but then didn’t get our main course until 11pm – after it ! There is a large Russian population in that area apparently and they were out in force – eating , drinking and dancing – lots of dancing ! The show was how I imagine a Las Vegas cabaret show to be ( not that I have been to Las Vegas yet ) – except it was all in Russian ! Lots of very energetic dancing and bits of stage that moved up and down. Sadly there was no photography or videoing allowed – but Bob told me afterward that maybe I was the only one sticking to the rules….. Such a shame – I would have loved to have shared some pictures with you ! I mean – look at that tree ! and the throne ! Not in bed until 1am – haven’t done that for a good few years – then feeling very tired on Saturday when we went to South Beach Miami for a haircut for me and a little shopping for both of us……. Early to bed on Saturday night after a delicious meal at another favorite restaurant – Valentino’s. There is always great street entertainment along Lincoln Rd in South Beach Miami …..
Sunday and Bob got his eyes tested and new glasses from Lenscrafters in the Aventura shopping mall – really good service and swanky selection of frames ! We also had a great visit to one of my very favorite furniture stores – Cargo – just off US1 at N 26th St in Fort Lauderdale. The guys here are lovely and we spent a great hour in there looking at furniture and then showing them lots of pictures of their furniture in our rental houses ! Sunday night and an early pay to view movie in our room- Spy with Melissa McCarthy – very funny and I do recommend it ! Just look what Bob found for Halloween in Home depot !!! Home on Tuesday afternoon – I just love that feeling as you come in to land in Eleuthera – like a long slow exhale – home again. Remind me to tell you and Bob about “straight” and “V” cuts when we see you in December! Love your blogs! Thanks for sharing them with us. We look forward–avidly–to returning to Eleuthera in early December. Thanks so much – I love it when I hear that people are reading and enjoying what I write …..
Hmmmnnn….maybe Bob could have a look at my right foot next time he drops by…. ?